>> THANK YOU FOR HELPING ME GET TO WORK. MUST BE A COOL DAD. MUST BE A VERY COOL DAD. >> James: WHAT WERE YOU CALLED? >> WE HAD A LOT OF DIFFERENT NAMES. I THINK IN THE HISTORY OF BAND NAMES MAYBE THE WORST. WE WERE SUPPOSED TO BE BAD. USUALLY A GREAT BAND NAME MEANS THE MUSIC HAS TO BE TERRIBLE. LIKE A BAND NAME BUT A PODCAST SPONSOR. >> IT'S A TERRIBLE NAME. >> James: LET'S TALK ABOUT TATTOOS. YOUR WHOLE BACK IS COVERED, RIGHT? >> James: WHERE'S IT STOP? >> FROM HERE TO HERE I'M PRETTY MUCH COVERED. >> James: I GOT A TATTOO. >> James: CARS FLOWERS IS THE BAND FOR MARINE 5. 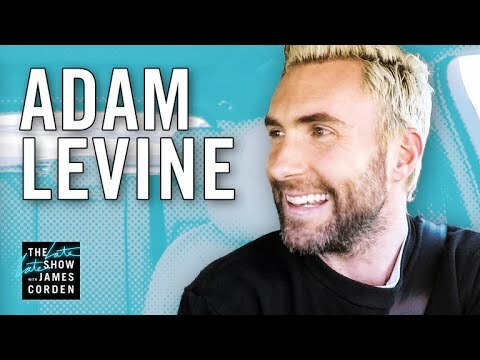 >> James: I WANT TO SEE THIS ADAM LEVINE FACE BALANCING. >> THIS MIGHT HAVE TO GO ON MY CHIN. >> James: OH, LOOK AT THAT! >> THAT'S A RIDICULOUS SKILL. >> James: YOU BROUGHT THIS FROM HOME. UM -- JAMES ALL RIGHT, GO ON. THIS IS A REAL FIRST. HOW ARE YOU BEING SO COOL ABOUT THIS? >> WE'RE SORRY, OFFICER, WON'T HAPPEN AGAIN. >> James: WE'RE BEING CAREFUL. I DON'T KNOW WHAT QUITE HAPPENED THERE. HOW ARE YOU SO CHILL? A SHERIFF PULLED US OVER. YOU'RE NOT AFFECTED BY IT. FULLY-FLEDGED BORN AND BRED ANGELINO. YOU WERE RAISED IN LOS ANGELES. >> I WAS BORN AND RAISED IN LOS ANGELES. I WAS BORN AT CEDARS. TWO DAUGHTERS WERE BORN THERE, TOO. WORDS ARE GOING TO BE, OH MY GOD, DAD. >> James: EVERY NOW AND THEN, YOU'LL JUST HEAR ONE WORD. MY KIDS ARE GROWING UP STREETS AWAY FROM WHERE YOU GREW UP. >> James: IT'S A BIG WORRY. HAD I HAVE KNOWN THAT, I WOULD NEVER HAVE BOUGHT HERE. >> James: NOW, YOU ARE SERIOUS ABOUT DRIVING. >> James: YOU LOVE IT BUT YOU LOVE LIKE RACING FAST CARS. YOU WANTED TO BE A RACE CAR. >> I LIKE TO GO FAST. I'VE BEEN ON A FEW TRACKS AND MET DRIVERS. >> YOU WOULDN'T HAVE A CHANCE. [ MUSIC ] ALL RIGHT, ALL RIGHT, ALL RIGHT. >> James: DID YOU PUT THIS ON? I DON'T KNOW IF THIS IS A SAFE THING. >> YOU'RE VERY VERY GOOD AT HOSTING! YOU'RE VERY BAD AT THIS. >> James: THIS IS EXCEPTIONAL. THIS IS A BIG FINISH, BIG FINISH [ BLEEP ] AND OH! I'M GOING TO RUIN YOU. >> James: NO, YOU'RE NOT. YOU CAN'T BEAT THAT TIME. >> WHAT TIME IS THAT? >> James: WHAT'S THE CAPITAL OF CALIFORNIA? >> James: OH SHUT UP, ADAM. OH MY -- WHAT ARE YOU DOING? YOU SO NEARLY HIT THAT CAR! >> James: WHAT SCHOOL DOES HARRY POTTER ATTEND? >> I DON'T KNOW THAT [ BLEEP ] NERD. OH MY GOD [ BLEEP ] HE MAY HAVE WON IT. HE MAY HAVE WON IT! OH, HE'S GOT IT NOW. I DID THE LAP IN 1:29. ADAM LEVINE, YOU DROVE THE LAP IN 1:51.